Consider this Craig Ventor piece about the new treasure trove of bacteria dna/proteins brought in by Craig Venter’s Institute. Science critics are hailing his work as the biggest deal in ocean going genetics since the Beagle voyages of Charles Darwin. How would this effect desalination research. It would be helpful if someone in the desalination community tasked the Craig Ventor Institute to keep an eye out for proteins that do desalination work. Great. So you get some desalination proteins. How do you make them into something useful? Remember Ventor as you read the article below. Blacksburg, Va., March 28, 2007 — Virginia Tech researchers announced last year that they had created a nanostructured membrane that incorporates DNA base pairs in order to impart molecular recognition and binding ability to the synthetic material. This year they will show for the first time that these new films, membranes, and elastomers are compatible with diverse organic and inorganic molecules and will adopt properties of the guest molecules. The research is being presented as an invited talk at the 233rd national meeting of the American Chemical Society in Chicago March 25-29. Chemistry professor Tim Long’s research group, students affiliated with the Macromolecule and Interfaces Institute (MII) at Virginia Tech, and the U.S. Army Research Laboratory created a block copolymer, where different monomers are linked in a sequential manner and form a nanostructured film. They used adenine and thymine nucleotides, two of the four DNA base pairs that recognize each other. Then the researchers experimented with different kinds of guest molecules with complementary hydrogen bonding sites (hydrogen has a low energy attraction to many types of atoms). Salts, as ordinary table salt, are hydrophilic (water loving) and their introduction into a block copolymer template permits the placement of the salts at the nanometer dimension. One can imagine forming of channels of salts that are not visible with the human eye, but act as a roadway for the transport of water molecules. “The research is synergy at the nanotechnology-biotechnology interface,” Long said. The talk, “Nucleobase-containing triblock copolymers as templates for the dispersion of guest molecules at the nanoscale” (PMSE 423) will be presented at 9:05 a.m. Wednesday, March 28, in McCormick Place South room S505A. Authors are Brian Mather of Albuquerque, a chemical engineering doctoral student in MII; Margaux B. Baker, an undergraduate student from the University of Michigan who studied with Long’s group during summer 2006; Long, and Frederick L. Beyer of the U.S. Army Research Laboratory. Mather received his undergraduate degree from the University of New Mexico. Learn more about his research at Virginia Tech by visiting www.chem.vt.edu/chem-dept/tlong/Brian.html. This is useful info to anyone doing membrane research. The key take away is that water molecules keep a distance of one molecule diameter from a water repelling surface. The article is here, as well as below. Researchers have found a gap between water and a water-repelling surface that can give new insight into the way water and oil separate. By using high-energy X-rays at the ESRF, an international team defined the size and characteristics of this gap. The knowledge of the structure of a hydrophobic interface is important because they are crucial in biological systems, and can give insight in protein folding and stability. The researchers publish their results this week in PNAS Early Online Edition. The repulsion of water is a phenomenon present in many aspects of our lives. Detergent molecules made up of components attracted to water (hydrophilic) and others that repel it (hydrophobic). Proteins also use the interaction with water to assemble into complexes. However, studying hydrophobic structures and what occurs when they encounter water is not entirely straightforward as it is influenced by certain factors. Early studies of the gap formed between water and a hydrophobic surface did not show a coherent picture.Scientists from the Max Planck Institute for Metals Research (Germany), the University of South Australia (Adelaide) and the ESRF carried out experiments on silicon wafers covered by a water-repulsive layer at the surface. The wafers were then immersed in water by a special cell. Studies of the water structure at the interface of the hydrophobic layer confirmed that a gap is formed between the layer and water and that its size is the diameter of a water molecule, somewhere between 0.1 and 0.5 nanometer. The integrated density deficit at the interface amounts to half a monolayer of water molecules.The scientists did further experiments in order to test the influence of gas, which is naturally present in water, on the hydrophobic water gap. During all their experiments they kept the water ultra clean (unlike water in nature) and they introduced gas into the cell until saturation. The result shows that, contrary to previous reports, gas does not play a role in the structure of water at flat interfaces. This is the first time that high energy synchrotron X-rays have been used as a tool to measure the properties of this gap. “Some teams have used neutrons, but they didn’t have enough resolution, after all, the gap is extremely small and difficult to track,” explained Harald Reichert, the paper’s corresponding author. Despite the superior quality of the X-ray beam, the experiment was still a challenge: the water-repellent layer on the silicon wafer can survive only 50 seconds under the beam, so measurements had to be completed very quickly. The next step for the team is to produce porous structures and study the properties of water at confined pore interfaces. “These studies will increase our knowledge of how water behaves in different environments. The structure of water in these environments is still, somewhat a mystery to us, despite the fact that our world is surrounded by water”, declared Reichert. Equipped with high-speed computers and the laws of physics, scientists from the University of Delaware and Radboud University in the Netherlands have developed a new method to “flush out” the hidden properties of water–and without the need for painstaking laboratory experiments. The UD researchers used clusters of Linux computers to perform the large-scale computer calculations required for the research. The study took several months to complete. The result is a new model — the first that can accurately predict both the properties of a pair of water molecules and of liquid water. Among its many applications, the research should help scientists better understand water in not only its liquid form, but in other states as well, such as crystalline forms of ice, and water in extreme conditions, including highly reactive “supercritical” water, which is used to remove pollutants in wastewater and recover waste plastic in chemical recycling, Szalewicz said. The model might also be used to model H2O in solution with Na & Cl. Anyhow, there ought to be a way for desalination researchers to make use of the new modeling tool on request. The rest of the article can be found here. Penny Smith, a mathematician at Lehigh University, has posted a paper on the arXiv that purports to solve one of the Clay Foundation Millenium problems, the one about the Navier-Stokes Equation. The paper is here, and Christina Sormani has set up a web-page giving some background and exposition of Smith’s work. In 2000, Georgia Tech researchers showed that fluid dynamics theory could be modified to work on the nanoscale, albeit in a vacuum. Now, seven years later they’ve shown that it can be modified to work in the real world, too – that is, outside of a vacuum. The results appear in the February 9 issue of Physical Review Letters. It’s well-known that small systems are influenced by randomness and noise more than large systems. Because of this, Georgia Tech physicist Uzi Landman reasoned that modifying the Navier-Stokes equations to include stochastic elements – that is give the probability that an event will occur – would allow them to accurately describe the behavior of liquids in the nanoscale regime. Writing in the August 18, 2006, issue of PRL, Landman and post doctoral fellow Michael Moseler used computer simulation experiments to show that the stochastic Navier-Stokes formulation does work for fluid nanojets and nanobridges in a vacuum. The theoretical predictions of this early work have been confirmed experimentally by a team of European scientists (see the December 13, 2006, issue of Physical Review Letters). Now, Landman and graduate student Wei Kang have discovered that by further modifying the Moseler-Landman stochastic Navier-Stokes equations, they can accurately describe this behavior in a realistic non-vacuous environment. A Cambridge University-led team of scientists have successfully produced live video footage that shows how carbon nanotubes, more than 10,000 times smaller in diameter than a human hair, form. The video sequences show nanofibres and nanotubes nucleating around miniscule particles of nickel and are already offering greater insight into how these microscopic structures self-assemble. The films can be viewed on the Cambridge University website. In particular, the team discovered that the carbon network is guided into tubular shape by a drastic restructuring of the nickel – the catalyst in the process. They were also able to track and time the deposition of the carbon around the nickel. Carbon nanotubes are new building blocks enabling engineers to improve and further miniaturise everyday electronic devices like computers or mobile phones. At the moment scientists can grow nanotubes but cannot accurately control their structure. Being able to do so is vital as it is the very structure of a nanotube that dictates its properties. The nano-scale video observations mean that scientists will be able to better understand the nucleation of nanotubes and are therefore an important step on the route towards application. The two sequences show action taking place in real time on an astonishingly small scale. The difference in size between a single-walled nanotube and a human hair is close to the difference between the same human hair and the Eiffel Tower. The microscopic scale involved has, in the past, made it difficult to understand the growth process. The team used X-rays produced at a synchrotron (a type of particle accelerator) and a modified high-resolution transmission electron microscope to observe and film a process called catalytic chemical vapour deposition. This is one of several methods of producing nanotubes, and involves the application of a gas containing carbon (in this case acetylene) to minute crystalline droplets referred to as “catalyst islands” (the nickel). As the gas is applied carbon sticks to the catalyst islands forming layers of graphite. In conditions appropriate to creating nanofibres, the nickel particle was pushed upwards in a series of peristaltic movements as the carbon continued to deposit on its sides. At several points the nickel formed a cap which almost “popped” out of the forming tube, leaving a layer of graphite behind it. This process is called “bambooing”, because the resultant carbon nanofibre is a cylinder containing several cavities, each one separated by one of these graphite layers, similar in form to bamboo. Throughout the whole process, the nickel remained crystalline rather than liquid. The team then looked at conditions more appropriate to producing single-walled carbon nanotubes, which involved less acetylene. The catalyst is not squeezed upwards. Instead, a cap of carbon formed on the top of the nickel, and gradually extended from it to form a tubular structure. The catalyst island was squeezed and reshaped by this process and was moulded by the carbon forming around it rather than retaining its original form. Dr Stephan Hofmann, who led the research, said: “In order to reach the full application potential for nanotubes, we need to be able to accurately control their growth first. As a manifestation of the impressive progress of nanometrology, we are actually now able to watch molecular objects grow. This new video footage shows that the catalyst itself remains crystalline but is constantly changing its shape as the carbon network is formed around it. According to this CSRwire press release this week–“In-Flight Media has produced an impressive current-event documentary type two-minute video clip for GSPI. The video illustrates a solution to both solving the fuel crisis and global warming crisis simultaneously”–(if you believe in CO2 as the cause of global warming–which I don’t) . “Over 5-million people will view this video on Continental Airline flights during the months of April and May (2007). A preview of this video is presently available for viewing at” http://video.google.com/videoplay?docid=595872956429027619. The article below fleshes out the algae-to-biodiesal angle pretty well. What the article doesn’t mention is that Greenfuels is now running second stage tests in Arizona using “greenhouse-like buildings about 30 feet wide by 500 feet long that will house the algae”. Future algae greenhouses could use Seawater Greenhouse desalination technology. This would be especially appropriate for areas in the southwest that have carbon dioxide producing plants sited above briny aquifers–or areas along the US coasts that use coal to produce electricity. As well, here is an article that says adding hydrogen to biomass — while its being turned into fuel — increases efficiencey significantly. The process is a “hybrid hydrogen-carbon process,” (H2CAR). According to this article the Hydrogen-Augmented Fischer-Tropsch Processes yields More Product, No CO2. The new approach modifies conventional methods for producing liquid fuels from biomass by adding hydrogen from a “carbon-free” energy source, such as solar or nuclear power, during a step called gasification. Adding hydrogen during this step suppresses the formation of carbon dioxide and increases the efficiency of the process, making it possible to produce three times the volume of biofuels from the same quantity of biomass. That would increase the output of greenhouses turning algae to biodiesal significantly. (Same goes for thermal depolymerization.) Further, solar panels mentioned here will come onstream next fall at 1/10 current costs to convert sunlight to electricity for electrolysis to produce hydrogen for the process mentioned above. While this talk is about fuel–it should be mentioned that the by product is… fresh water. The article below mentions that they expect the algae to yield biodiesal for $50@ barrel. I think those numbers will fall. Oil-rich plants such as soy may offer a cleaner energy alternative to diesel fuel, but Jim Sears says these food crops can’t meet all our diesel needs. The Colorado-based entrepreneur says, even in America’s bountiful croplands, farmers couldn’t grow enough oilseed crops to meet demand. Fortunately, Sears says, an unconventional crop could produce 100 times more biodiesel per hectare than either canola or soy. It can thrive in places where other crops can’t grow at all, and it only requires the equivalent of 5 centimeters of rain a year. It’s algae, a small but familiar plant, usually seen as a green scum that forms on ponds or aquarium glass. To demonstrate his crop’s potential, Sears leads the way inside a former coal-fired electric power plant, now the Engines and Energy Conversion Laboratory at Colorado State University (CSU). CSU and Sears’ small company, Solix Biofuels, have teamed up for this research. Sears passes a two-story tall engine that may soon be running on his biodiesel, and heads to a quieter room where test batches of algae grow in glass beakers. The water ranges from pale yellow to soft Irish green, thanks to millions of microscopic algae. Biologist Nick Rancis lifts a favorite specimen. “Here we have a species of green algae that grows in fresh water. As you can see, it grows very high density. You can’t even see through it when you hold it up to the light.” He says this strain produces enormous amounts of fat: up to 50 percent of its body weight. And while producing oil from soy or canola generally requires a three to five-month growing season, some algae are so prolific, over half a batch can be harvested for oil production every day. “They can double or triple overnight,” Rancis says. For industrial production, the researchers are designing enormous growing troughs, wider than two trucks side by side, as long as a football field, and grouped by the thousands around processing plants. In this way, Sears says, algae could supply all the U.S. diesel power on a fraction of the nation’s farmland, just one percent of the 400 million hectares now under cultivation. Because building a vast new production system is an enormous undertaking, Sears predicts that it will be five to ten years before biodiesel from algae becomes commonplace. However, Eric Jarvis, a senior scientist at the National Renewable Energy Lab, cautions that it may take longer. “I wouldn’t expect it to meet a large demand for diesel in that time frame, but I’m hoping to see some good demonstration projects in the next 5 to 10 years.” He adds that in the last two years, interest in developing systems for biodiesel from algae has grown tremendously, and he gets phone calls every week from people trying to get into this area. The National Renewable Energy Lab plans to step up their development of biodiesel from algae within the year, and they estimates that along with Colorado State and Solix Biofuels, roughly a dozen other groups around the world are developing similar projects, increasing the likelihood that someday soon, clean-burning algae biodiesel will be the fuel of choice for trucks, boats . . . and trains. Researchers at the U.S. Department of Energy’s Argonne National Laboratory have developed an advanced concept in nanoscale catalyst engineering – a combination of experiments and simulations that will bring polymer electrolyte membrane fuel cells for hydrogen-powered vehicles closer to massive commercialization. The results of their findings identify a clear trend in the behavior of extended and nanoscale surfaces of platinum-bimetallic alloy. Additionally, the techniques and concepts derived from the research program are expected to make overarching contributions to other areas of science well beyond the focus on electrocatalysis. The Argonne researchers, Nenad Markovic and Vojislav Stamenkovic, published related results last month in Science and this month in Nature Materials on the behavior of single crystal and polycrystalline platinum alloy surfaces. The researchers discovered that the nanosegregated platinum-nickel alloy surface has unique catalytic properties, opening up important new directions for the development of active and stable practical cathode catalysts in fuel cells. Their experiments and approach sought to substantially improve and reduce platinum loading as the oxygen-reduction catalyst. The research identified a fundamental relationship in electrocatalytic trends on surfaces between the experimentally determined surface electronic structure (the d -band centre) and activity for the oxygen-reduction reaction. This relationship exhibits “volcano-type” behavior, where the maximum catalytic activity is governed by a balance between adsorption energies of reactive intermediates and surface coverage by spectator (blocking) species. The electrocatalytic trends established for extended surfaces explain the activity pattern of nanocatalysts and provide a fundamental basis for the enhancement of cathode catalysts. By combining experiments with simulations in the quest for surfaces with desired activity, the researchers developed an advanced concept in nanoscale catalyst engineering. Through continued research combining nanoscale fabrication, electrochemical characterization and numerical simulation a new generation of multi-metallic systems with engineered nanoscale surfaces is on the horizon. Argonne’s Center for Nanoscale Materials, Advanced Photon Source and Electron Microscopy Center will enable some of this research. “We have got crucial support from Argonne management to set up the new labs and launch research directions, which would establish Argonne as a leading center in basic sciences related to energy conversion.” said Stamenkovic. Their lab includes a custom built three-chamber UHV system equipped with the state-of-the-art surface sensitive tools, including Low Energy Ion Scattering Spectroscopy (LEISS), Auger Electron Spectroscopy (AES), angle resolved X-ray photoemission spectroscopy (XPS with monochromator), ultraviolet photoelectron spectroscopy (UPS), Low Energy Electron Diffraction (LEED) optics, sputtering guns, thermal evaporators, dual hemispherical analyzers, and chamber with scanning tunneling microscopy (STM) and atomic force microscopy AFM. All three chambers are connected to each other but they can also work as independent chambers, making it possible to transfer samples from one to the other unit in order to get detailed surface characterization or to make desirable surface modification. “We hope that this research program will lead the nation to more secure energy independence and a cleaner environment for future generations,” Markovic said. Is it Possible Graphene Could Be Used For Desalination? There have been a couple of articles over the last year on the use of “graphene-based materials.” Graphene is interesting because– rolled up its a carbon nanotubes. However, laid out flat — its graphene — and it is cheap and plentiful. But Geim and colleagues say that the appeal of this kind of carbon lies not with nanotubes in themselves, but with the underlying fabric: the flat sheets of graphene. They have developed methods for splitting graphite apart into its separate layers and lying them down flat on a surface, where their electrical properties can be studied. A graphene sheet is electrically conducting, behaving essentially like a two-dimensional metal. But it is a strange kind of metal, with properties dictated by quantum mechanics. For example, even if there are no mobile electrons to carry an electrical current, the electrical conductivity can never fall below a certain minimum value: it is like an electron gate that can never be fully closed. And the Manchester researchers have shown that graphene can be fashioned into a device called a spin valve, which discriminates between mobile electrons according to their spin. Maybe too this could be worked into a filter of some sort to take out charged Na or Cl ions. Researchers have used the world’s thinnest material to create a new type of technology, which could be used to make super-fast electronic components and speed up the development of drugs. Physicists at The University of Manchester and The Max-Planck Institute in Germany have created a new kind of a membrane that is only one atom thick. It’s believed this super-small structure can be used to sieve gases, make ultra-fast electronic switches and image individual molecules with unprecedented accuracy. The findings of the research team is published today in the journal Nature. Two years ago, scientists discovered a new class of materials that can be viewed as individual atomic planes pulled out of bulk crystals. These one-atom-thick materials and in particular graphene – a gauze of carbon atoms resembling chicken wire – have rapidly become one of the hottest topics in physics. However, it has remained doubtful whether such materials can exist in the free state, without being placed on top of other materials. Now an international research team, led by Dr Jannik Meyer of The Max-Planck Institute in Germany and Professor Andre Geim of The University of Manchester has managed to make free-hanging graphene. The team used a combination of microfabrication techniques used, for example, in the manufacturing of microprocessors. A metallic scaffold was placed on top of a sheet of graphene, which was placed on a silicon chip. The chip was then dissolved in acids, leaving the graphene hanging freely in air or a vacuum from the scaffold. The resulting membranes are the thinnest material possible and maintain a remarkably high quality. Professor Geim – who works in the School of Physics and Astronomy at The University of Manchester – and his fellow researchers have also found the reason for the stability of such atomically-thin materials, which were previously presumed to be impossible. They report that graphene is not perfectly flat but instead gently crumpled out of plane, which helps stabilise otherwise intrinsically unstable ultra-thin matter. Professor Geim and his colleagues believe that the membranes they have created can be used like sieves, to filter light gases through the atomic mesh of the chicken wire structure, or to make miniature electro-mechanical switches. It’s also thought it may be possible to use them as a non-obscuring support for electron microscopy to study individual molecules. This has significant implications for the development of medical drugs, as it will potentially allow the rapid analysis of the atomic structures of bio-active complex molecules. “This is a completely new type of technology – even nanotechnology is not the right word to describe these new membranes,” said Professor Geim. A second article this week on the subject by the same team suggests the work could be used for transistors. found that a single sheet of graphene, a form of carbon atoms in a plane just one atom thick, can be isolated and used as an electromechanical resonator. Posted in: Water Desalination Research and Development | Comments Off on Is it Possible Graphene Could Be Used For Desalination? The elemental or “zero-valent” iron (Fe) used in the technology is widely available as a byproduct of iron and steel production, and it is inexpensive, currently costing less than 40 cents a pound (~$750/ton). Viruses are either chemically inactivated by or irreversibly adsorbed to the iron, according to the scientists. The elemental iron also removed organic material, such as humic acid, that naturally occurs in groundwater and other sources of drinking water. I’m also thinking that Fe might also have a pretty stiff charge that would ward off some dissolved salts. 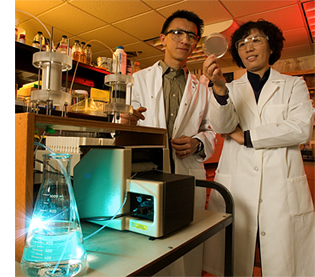 Pei Chiu (left), an associate professor in UD’s Department of Civil and Environmental Engineering, and Yan Jin, a professor of environmental soil physics in UD’s plant and soil sciences department, have developed an inexpensive, nonchlorine-based technology that can remove harmful microorganisms from drinking water, including viruses. 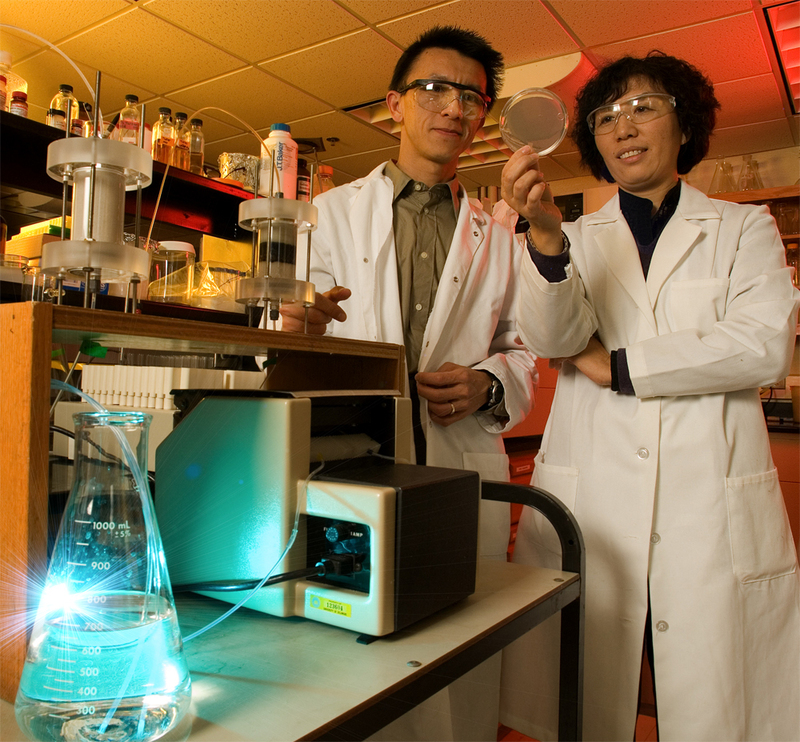 3:21 p.m., Feb. 26, 2007–University of Delaware researchers have developed an inexpensive, nonchlorine-based technology that can remove harmful microorganisms, including viruses, from drinking water. UD’s patented technology, developed jointly by researchers in the College of Agriculture and Natural Resources and the College of Engineering, incorporates highly reactive iron in the filtering process to deliver a chemical “knock-out punch” to a host of notorious pathogens, from E. coli to rotavirus. The new technology could dramatically improve the safety of drinking water around the globe, particularly in developing countries. According to the World Health Organization (WHO), over a billion people–one-sixth of the world’s population–lack access to safe water supplies. Four billion cases of diarrheal disease occur worldwide every year, resulting in 1.8 million deaths, primarily infants and children in developing countries. Eighty-eight percent of this disease is attributed to unsafe water supplies, inadequate sanitation and hygiene. In the United States, viruses are the target pathogenic microorganisms in the new Ground Water Rule under the Environmental Protection Agency’s Safe Drinking Water Act, which took effect on Jan. 8. “What is unique about our technology is its ability to remove viruses–the smallest of the pathogens–from water supplies,” Pei Chiu, an associate professor in UD’s Department of Civil and Environmental Engineering, said. Chiu collaborated with Yan Jin, a professor of environmental soil physics in UD’s plant and soil sciences department, to develop the technology. They then sought the expertise of virologist Kali Kniel, an assistant professor in the animal and food sciences department, who has provided critical assistance with the testing phase. “A serious challenge facing the water treatment industry is how to simultaneously control microbial pathogens, disinfectants such as chlorine, and toxic disinfection byproducts in our drinking water, and at an acceptable cost,” Chiu noted. Viruses are difficult to eliminate in drinking water using current methods because they are far smaller than bacteria, highly mobile, and resistant to chlorination, which is the dominant disinfection method used in the United States, according to the researchers. Of all the inhabitants of the microbial world, viruses are the smallest–as tiny as 10 nanometers. According to the American Society for Microbiology, if a virus could be enlarged to the size of a baseball, the average bacterium would be the size of the pitcher’s mound, and a single cell in your body would be the size of a ballpark. “By using elemental iron in the filtration process, we were able to remove viral agents from drinking water at very high efficiencies. Of a quarter of a million particles going in, only a few were going out,” Chiu noted. The idea for the UD research sprang up when Jin and Chiu were discussing their respective projects over lunch one day. Since joining UD in 1995, Jin’s primary research area has been investigating the survival, attachment and transport behavior of viruses in soil and groundwater aquifers. One of the projects, which was sponsored by the American Water Works Association Research Foundation, involved testing virus transport potential in soils collected from different regions across the United States. Jin’s group found that the soils high in iron and aluminum oxides removed viruses much more efficiently than those that didn’t contain metal oxides. “We knew that iron had been used to treat a variety of pollutants in groundwater, but no one had tested iron against biological agents,” Chiu said. So the two researchers decided to pursue some experiments. With partial support from the U.S. Department of Agriculture and the Delaware Water Resources Center, through its graduate fellowship program, the scientists and their students began evaluating the effectiveness of iron granules in removing viruses from water under continuous flow conditions and over extended periods. Two bacteriophages–viruses that infect bacteria–were used in the initial lab studies. 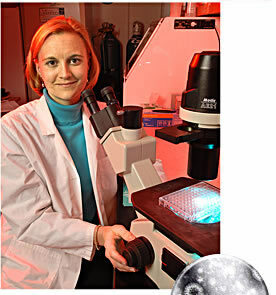 Kali Kniel, a virologist at UD, has provided critical expertise in documenting the UD technology’s effectiveness in removing pathogens such as rotavirus, shown in the magnified view at right. Rotavirus is the number-one cause of diarrhea in children. Since then, Kniel has been documenting the technology’s effectiveness against human pathogens including E. coli 0157:H7, hepatitis A, norovirus and rotavirus. Rotavirus is the number-one cause of diarrhea in children, according to Kniel. The elemental iron also removed organic material, such as humic acid, that naturally occurs in groundwater and other sources of drinking water. During the disinfection process, this natural organic material can react with chlorine to produce a variety of toxic chemicals called disinfection byproducts. “Our iron-based technology can help ensure drinking-water safety by reducing microbial pathogens and disinfection byproducts simultaneously,” Chiu noted. Besides helping to safeguard drinking water, the UD technology may have applications in agriculture. Integrated into the wash-water system at a produce-packing house, it could help clean and safeguard fresh and “ready to eat” vegetables, particularly leafy greens like lettuce and spinach, as well as fruit, according to Kniel. “Sometimes on farms, wash-water is recirculated, so this technology could help prevent plant pathogens from spreading to other plants,” she said. This UD research underscores the importance of interdisciplinary study in solving problems. “There are lots of exciting things you can discover working together,” Jin said, smiling. “In this project, we all need each other. Pei is the engineer and knows where we should put this step and how to scale it up. I study how viruses and other types of colloidal particles are transported in water, and Kali knows all about waterborne pathogens. “Our hope is that the technology we’ve developed will help people in our country and around the world, especially in developing countries,” Jin noted. Currently, the Centre for Affordable Water and Sanitation Technology in Calgary, Canada, is exploring use of the UD technology in a portable water treatment unit. Since 2001, the registered Canadian charity has provided technical training in water and sanitation to more than 300 organizations in 43 countries of the developing world, impacting nearly a million people. The University of Delaware is pursuing commercialization opportunities for the research. Patents have been filed in the United States, Canada, France, Germany and Switzerland. For more information, contact Bruce Morrissey, UD director of technology development, Office of the Vice Provost for Research and Graduate Studies, at [brucem@udel.edu] or (302) 831-4230.